Superbly written and directed by Shane Meadows and featuring a terrific soundtrack, this is a compelling coming of age drama with a brilliant performance from young Thomas Turgoose. 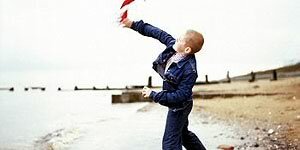 Based on writer-director Shane Meadows' own childhood experiences, This Is England is set in 1983 and stars Thomas Turgoose as 12-year-old Shaun Field (see what he did there? ), a lonely boy who's bullied at school and whose dad has recently died in the Falklands War. On his way home, Shaun is befriended by a group of unexpectedly friendly skinheads, including charismatic, likeable Woody (Joe Gilgun), laid-back Milky (Andrew Shim) and petulant fatty Gadget (Andrew Ellis). Accepted into their gang, Shaun finds role-models in both Woody and Milky, as well as parties, music and even a potential girlfriend (Rosamund Hanson as Smell). However, when older, overtly racist skinhead Combo (Stephen Graham) returns from prison, the group splits in two and Shaun is drawn into dangerous territory. Newcomer Thomas Turgoose gives an astonishing performance, brimming with humour and a desire to be liked but also hiding deep pain and anger over the loss of his father. Also, his physical resemblance to Meadows is nothing short of uncanny. The supporting cast are equally good, particularly Gilgun, Meadows regular Shim and Vicky McClure as Woody's girlfriend, Lol. Graham handles his part well – his scenes are incredibly tense to watch, because he's friendly on the surface but there's an undercurrent of hatred and anger that is itching to break free. Meadows has an exceptional eye for period detail and he orchestrates some terrific scenes, particularly an opening 1980s montage and a wonderful, wonderful montage sequence after Shaun has joined the gang, scored to a track by Toots and the Maytals. The image of Shaun dancing along with his friends is one of the highlights of the year. An engaging, brilliantly written and superbly directed film that's evocative, funny, suspenseful and ultimately moving. Unmissable.